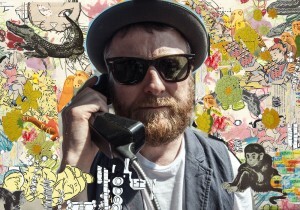 The eleventh person in our series of introductions to performers taking part in International Poetry ReIncarnation at the Roundhouse in Camden on 30th May 2015 is poet and promoter extraordinaire Daniel Cockrill. Daniel Cockrill, who will be your genial host for the night of ReIncarnation, has been saying words out loud since 1996. He is co-founder of BANG SAID THE GUN, ‘the poetry event for people who don’t like poetry’ and PAGEMATCH, a show which smashes together the Razzamatazz of Wrestlemania with all your favourite spoken word artists. He was an Executive Producer for 15 short poetry films for Channel 4 which included Kate Tempest, Hollie McNish, Elvis McGonagall, Rob Auton, David J, Polarbear and Byron Vincent. Daniel’s words have appeared in books, newspapers, magazines, on gallery walls, at major festivals, on stage, radio and television. He is also a regular contributor to the Poetry Takeaway, ‘the world’s first mobile poetry emporium’. He has two full collections of work entitled Pie and Papier-Mâché and Sellotaping Rain To My Cheek and is co-editor of the Bang Said The Gun Anthology Mud Wrestling With Words published by Burning Eye Books. Here’s a film poem by Daniel Cockrill from Channel 4’s Random Acts. CH4 Random Acts – Margate – 2013 from Paperback Films on Vimeo.